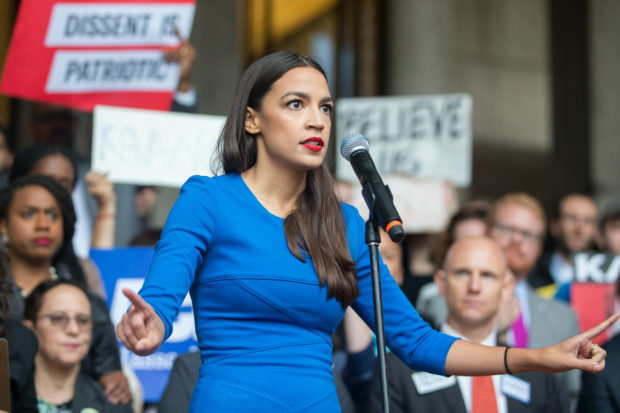 Thread: Wild-eyed, math-deficient, socialist becomes youngest woman ever elected to Congress. Young, Black And Conservative. shared a post. Whoever voted for her is just dumb. One must ask why any New York Republican who lives in that district couldn't beat this woman. Has New York fallen so far into the Lost Civilization Zone that they couldn't find ONE INTELLIGENT REPUBLICAN in that district to defeat her? What about the college professor who ran for this seat who is a Republican? Why wasn't he covered by the media? Why wasn't his name known to people in the district? Why, why, why didn't we fight for this seat and keep this moron out of the Congress? It obviously wouldn't have taken much. Even an interview on Fox somewhere would have probably been enough. Every ballot that voted for her needs to be investigated for FRAUD, non-citizens voting! If there is fraud she needs to be disqualified and not be allowed in the Congress! The vote count was really small. Democratic New York congressional candidate Alexandria Ocasio-Cortez is still struggling to explain how she expects to pay for her expensive “Medicare for All” plan. Ocasio-Cortez, who upset incumbent Rep. Joe Crowley in the Democratic primary, has repeatedly been unable to answer how she will pay for her socialistic policies. A study by the George Mason University Mercatus Center claims Medicare for All would cost $32.6 trillion in government spending over 10 years. “People often say, like, ‘how are you going to pay for it?’ And I find the question so puzzling, because, how do you pay for something that’s more affordable?” Ocasio-Cortez said. Ocasio-Cortez’s claim that Medicare for All would be cheaper than the current health system is inaccurate. While the Mercatus Center study estimated drug prices would fall under Medicare for All, higher demand would still significantly drive up costs.